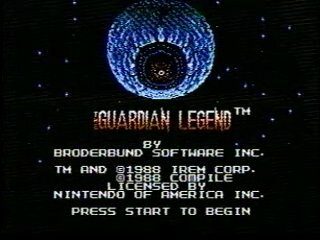 Released in February 1988, The Guardian Legend featured an innovative combination of shmup stages with Zelda-style exploration. The game also features a female protagonist, which was rare for Nintendo games. It turns out the world of Naju is teeming with evil creatures and is hurtling towards Earth. Your mission is to activate the self-destruct mechanisms on Naju before it reaches Earth. First off, many runners and viewers put work towards the unmaking of this game. We all have a hand in this madness. Many thanks to Votova, ShinerCCC, Zakky, Fireball, 13thFridayGirl and my viewers who clamored for more TGL at all times. If I missed you, harass me and I'll add you on! Cutscene skip: By holding Select after leaving a menu, you can cause the transformation scene and the final fly out sequence to be skipped. Item Drop Sequence: Items drop in sequence, looping back to the first item afterwards. This allows manipulation of what items drop when. Rarely is it precise, but suffice to say if you fight similar enemies, your items will be fairly consistent. Map optimization: My minimizing backtracking and resetting death warps, you can cut screens off the game. One less Attack Up: By the math of Sabermetrics, your Saber weapons will do maximum possible damage allowed to a boss with only one Attack Up. This skips a dangerous Leech Flower fight in Area 4, alters a few strategies but overall saves about 10 seconds. Saber vs Crab: The 2nd blue Crab dies real quick to the Level 2 Saber, since I now do the corridor before fighting him, its doable. Corridor 0: Less rhythm game, more item boxes! By cycling to the third item box, you ensure a heart drop on the boss, allowing for a more aggressive fight. The Defense Grid goes down .4 seconds slower than my best. Area 0 – Corridor 1: A few misteps, the Hockey Pucks tried to play hero with a savage spawn pattern, but I make it to the corridor. Simple fly through minimizing kills to keep my leveling at expected times. Good crab battles, we move on. Area 2: Thanks to map strategies, I go Corridor first, then fetch the two landers above. Crawdaddy almost takes the kill, but I sneak past him. More awful spawns, another good crab fight, and moving on. Area 3: I now deal with Corridor 3 without the defense boost, getting it later to save screen transitions (again, credit to the helping runners). Optomon is a jerk, I've killed him faster but he's always a nail biter. Leech Flower makes a strange sideways bounce, costing me time and the quick exit. Area 4: Skipping the Attack Up is fine in this area, it changes a few strategies later but with Level 3 Saber weapons, the damage cap on bosses is still hit, making the power up ineffective. Minor error in the gate opening sequence. Area 5: Very straight forward, no major issues or changes from the last run. Area 6: Using the Double Saber to skip a weapon transition. Again, the run route now walks past a Lander boss to create a death warp in a better location, cutting many room transitions. Surprisingly high damage taken before the boss, but no issue. Area 7: Warp around to get Landers, the pace of items picked up in the corridor allows me to keep the Double Saber on at all times. Area 8: Plays the same as before. Area 9: Massive damage taken in the intro area. Due to the one less attack power, I can no longer kill the Bomb Pods in the corridor like I used to. Enemy Erasers are used instead. This costs some time, but also creates favorable item drops against the boss, saving the rapid switching/safety strategy of hiding on the side of the screen. It's a net gain of time, so yay! Area 10: Botch the block clip, an excellent Widowmaker, great item drops on the boss. GG. Boss Rush: Typical first bosses, great Red Optomon, Blue Grimgrin goes smoothly, and I remembered the #$^%#ing cutscene skip this time! It: It's frontloaded health is bad, since you get less item boxes while fighting him. The luck on his bubble shots are OUTRAGEOUS! Again, with lower attack power, I can't break them as fast, so they typically hit if he shoots them left (2 damage apiece, it ain't pretty). I missed a few rockets, so the Red Chip didn't spawn fast enough, leading to early Enemy Erasers. I use them again when he goes yellow to make a cache to finish him off with.